Started taking underwater images in 2007 with a compact camera. Soon upgraded to Nikon D80 SLR in Nexus housing 2008 after taking part in a underwater workshop with renown teacher, Martin Edge. I used up this set up to August 2011 when I decided to upgrade once again. 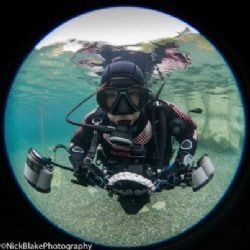 I now use Nikon 7000 in a Nauticam Housing and twin Inon 240 strobes. Not sure favourite dive site as all have something special, but love Indonesia/ Malaysia, recently visited Grand Cayman when travelling abroad I do enjoy joining underwater photo workshops, as a way of gaining experience and idea's shared by other like minded photographers. I also enjoy the challenge of UK water's which I have started photographing in the last couple of years.